A government shutdown can be just 24 days away because DDT really wants to have one. “I would do it because I think it’s a great political issue,” DDT told reporters. He can cause one because he is responsible for signing the budget by September 30 that keeps the government functioning. DDT’s advice came from Rush Limbaugh. “Rush Limbaugh said it’s the greatest thing you can do,” DDT said. Senate Majority Leader Mitch McConnell said that there is “no chance of a government shutdown,” but he turned control of the government over to DDT. DDT constantly pushes the idea that refugees pose a tremendous security threat and dismissed an intelligence assessment that proves the opposite. AG Jeff Sessions “doesn’t agree” with government research showing a faulty percentage of domestic terrorism. In a Catch 22 system, domestic terrorism isn’t a problem because domestic terrorists can’t be charged with terrorism. Of court, it appears the foreign terrorists are the most dangerous because they are the only ones classified as terrorists. Thus DDT restricts the number of refugees coming into the country. In DDT’s legacy of orphans, 416 migrant children—14 of them under the age of 5—have still not been reunited with their families despite the July court-mandated deadline for this to be done. The government never had a plan for reunification, and no one has been held accountable. Instead, private citizens must do the government’s work. DDT’s administration plans to not comply with the Flores settlement, the federal decree governing standards for child migrants since 1997 that these children be in the “least-restrictive” conditions possible. A federal court ruled in 2015 that children must be released from detention jails within 20 days. DDT cannot override this decision, but he can create replacement regulations. These must, however, comply with federal legal standards. Judge Dolly Gee ruled in July that the DOJ could not indefinitely detain children and parents together, the policy that DDT now wants to implement. DDT’s new rules would allow a third-party entity to evaluate jails, but doesn’t specify which entity. New licensing guidelines by the federal government wouldn’t change the miserable conditions in these jails that have histories of violent and physical abuse. Last month, a parent filed a lawsuit after her toddler died soon after reunification following lack of medical care in a Texas jail. 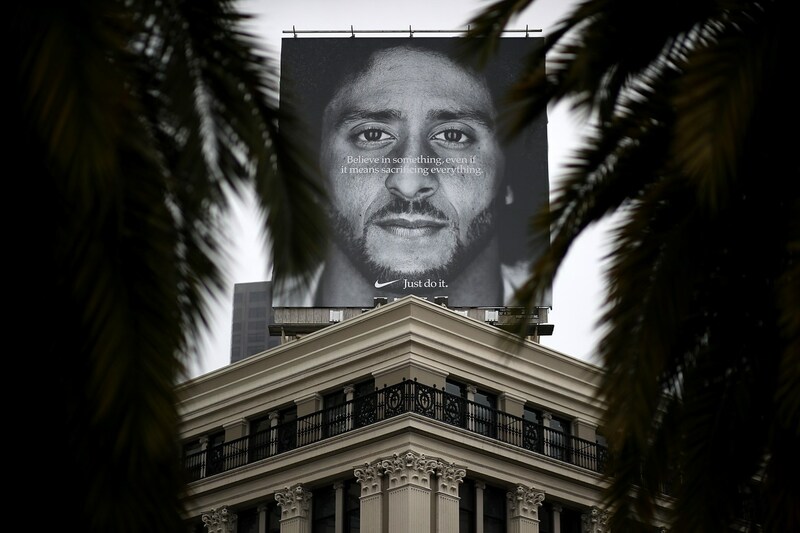 DDT explained why he’s avoiding the topic of Nike’s hiring Colin Kaepernick, the football player who started kneeling at games to protest social injustice and police killing blacks, for advertising: “Nike is a tenant of mine. They pay a lot of rent.” Nike moved out of Trump Tower a year ago but still has another four years on its lease. Conservatives incessantly ridicule and attack Kaepernick for calling on people to “Believe in something even if it means sacrificing everything,” saying that he had sacrificed very little compared to others. Kaepernick’s ad doesn’t say that he had been the person who sacrificed. He finished his ad by saying, “Don’t ask if your dreams are crazy. Ask if they’re crazy enough.” Kaepernick may be NFL’s worst nightmare even if his ads do support corporate America. DDT does have a lot to say about Bob Woodward’s new book, Fear, and he wants libel laws changed so that he can get “retribution” against the author. Last January, he called for laws to protect him after the publication of Michael Wolff’s Fire & Fury, saying that libel laws are “a sham and a disgrace and do not represent American values or American fairness.” To win libel suits, public officials must prove that the defendant maliciously published false and defamatory statements. Sort of like DDT’s tweets. In answer to claims that Woodward’s book is a “fabrication,” a current member of DDT’s administration published an anonymous op-ed in the New York Times, a highly unusual practice for the publication. “I Am Part of the Resistance Inside the Trump Administration” comes from a “senior official in the Trump administration, one of hundreds in this category. The person, whose identity is known by the NYT, supports conservative policies such as less regulation and more military but writes that any progress in conservative policies have come in spite of and not because of the current administration. The person concludes, “The bigger concern is not what Mr. Trump has done to the presidency but rather what we as a nation have allowed him to do to us. We have sunk low with him and allowed our discourse to be stripped of civility.” The piece is worth a read. DDT’s anti-leaking policy leaked that DDT narrowed the list of authors to 12—13, counting Melania Trump. The use of the word “lodestar” could point at VP Mike Pence and his aides—or it could be a red herring wanting people to look in that direction. People have a reason for calling the White House “crazytown” with all its denials and finger-pointing. Some GOP senior officials anonymously support the op-ed, and House Speaker Paul Ryan (R-WI) says he knows of no role that Congress would have to investigate. DDT’s explosion at this publicity may equal that of Hurricane Florence heading toward a large portion of the United States. 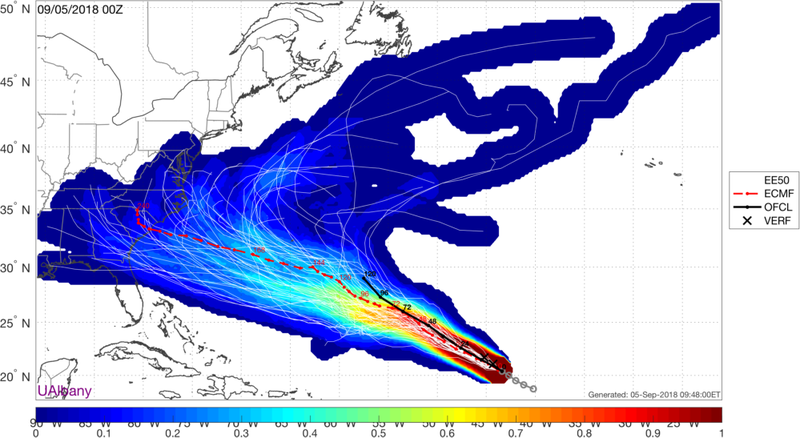 This image comes from the European model, more accurate than U.S. reporting, from two days ago. Since then the storm has calmed down somewhat but may accelerate into a Category 4 hurricane by the time it hits the east coast of the U.S. within the next few days. With its new president, Mario Abdo Benítez, Paraguay will keep its Israel embassy in Tel Aviv after claiming that it will join the U.S. in Jerusalem just three months ago out of concern for renewed violence in the Middle East. On the day that the U.S. embassy was formally opened in Jerusalem, Israeli forces shot and killed 58 protesting Palestinians. Israel retaliated in Parguay by closing its embassy in Asunción and recalling its ambassador. DDT has taken 234,000 acres of land near Minnesota’s Boundary Waters Canoe Area from the public to open it up for mining. That’s over 365 square miles in a wilderness area with over 1,000 lakes, over 1,000 miles of canoe routes, and many hiking trails. Mining brings harm to water quality and risks to the tourism economy. Last year, Agriculture Secretary Sonny Perdue had promised a two-year environmental review before opening the watershed to mining. Nine-eight percent of the 180,000 respondents supported protection for the watershed. DDT had already reinstated two expired federal mineral leases that could be taken by a foreign-owned company; its owner leases a house to Ivanka Trump and Jared Kushner in Washington, D.C.
DDT went to Montana yesterday to tell 10,000 people about the NYT op-ed, his mental health, and the possibility of his impeachment, managing to slip in a few mentions about a GOP candidate during the hour-long speech. Amidst a multitude of lies, he covertly praised GOP Rep. Greg Gianforte (R-MT) for physically attacking a reporter asking a question the night before his election in 2016. The representative later pleaded guilty to a misdemeanor assault. 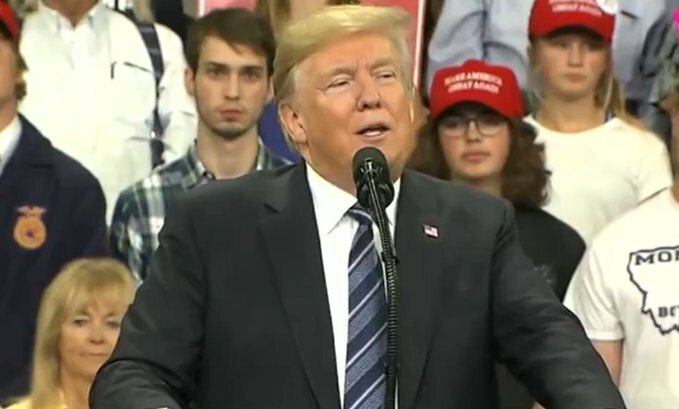 The high school students in the plaid shirt and MAGA hat were removed because they didn’t look enthusastic enough. Video here. Federal prosecutors are investigating the Trump Organization for violation of campaign finance laws after the guilty plea by DDT’s former attorney Michael Cohen and his admission about payments to hush Stormy Daniels and Karen McDougal. Allen Weisselberg, the organization’s CFO, is cooperating. DDT wants to make his cooperation, “flipping,” illegal.